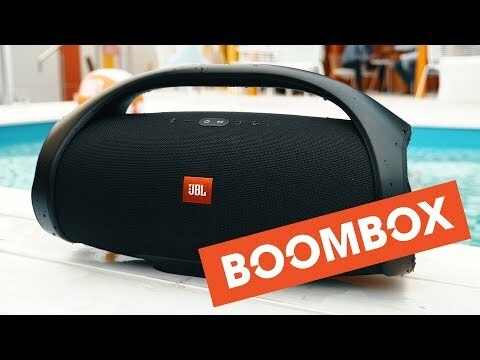 JBL Boombox heeft als beoordeling 4.5 van de 5 door 450. Rated 5 van de 5 door turismoboy13 uit Amazing sound quality I bought this 34 days ago and have loved it since I don't like getting it dirty but theres nothing JBL can do about that lol but it has enough power to shake some smaller things on your walls and put a thump in your chest if your in a bedroom sized room and sounds great the only thing I hate Is how easy it is to scratch and wish it had a backpack case thing but I wont complain everything has its ups and downs If they ever do make a JBL boombox 2 I will be buying it the day it comes out for sure so I can always have the biggest waterproof portable speaker on the market it is great and fills every need I have as i walk down the hallways of my school with tremendous bass filling the halways. Rated 5 van de 5 door Dieselhead uit Amazing Sound - Versatile - GREAT battery! 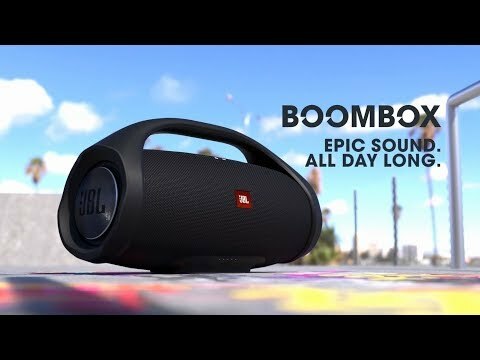 I have had this boombox for a couple of months now and can honestly say that it is the best I have seen and heard, and the battery life is likely my favorite aspect, I have used this thing at work ,outside, in cool weather, at moderate volumes on and off for nearly two weeks, likely 24 hours of combined use on one charge! The sound is great and can be loud as you will need...as a Heavy Equipment Technician, I use this in the cabinet of my service truck, and you can hear it easily around the biggest equipment out there without full volume. Build quality is what one would expect from an HK company, you are getting what you pay for. Buy it...love it!!! Rated 5 van de 5 door OLI_Boombox uit BRAVO JBL !!! Ich habe den Flip 4, den Xtreme und nun die Boombox. Jeder Lautsprecher ist eine Steigerung in Sachen Soundqualität. 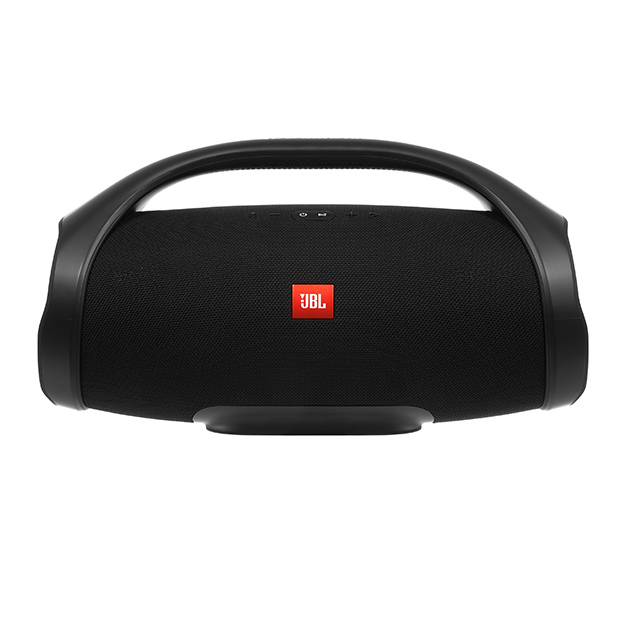 Die Boombox spielt leise wie laut auf einem Niveau das ich so von einem Bluetoothlautsprecher nie für möglich gehalten habe. Der Bass ist wahnsinnig präzise und kraftvoll, die Mitten sehr gut abgestimmt und die Höhen fein und sauber. 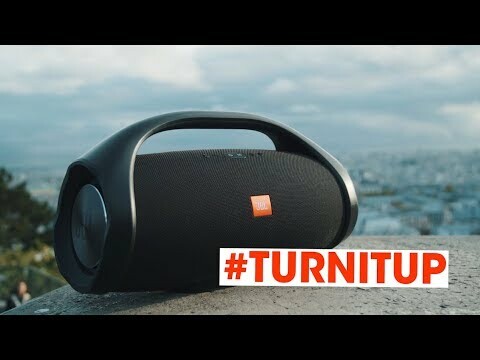 Mit der Boombox kann man das Thema Bluetoothlautsprecher ad acta legen. Ich würde sie mir immer wieder kaufen. Der Preis ist absolut gerechtfertigt, da die Boombox eine Stereoanlage ersetzt und sehr hochwertig rüberkommt. Super JBL!!! Rated 5 van de 5 door EggyDog uit Awesome! I’ve not even had this product for a week, and all I can say is it’s awesome! It’s a good job I live in a detached house otherwise the neighbours would hate me! 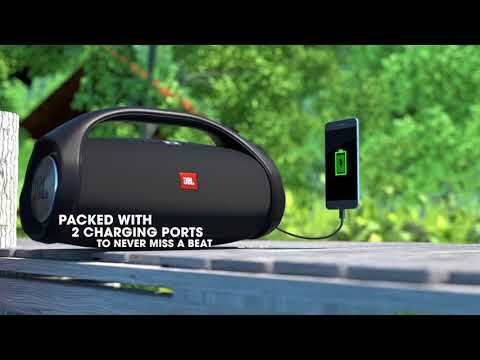 The volume, bass, and overal sound quality is amazing, it even has an outdoor mode which makes outdoor listening even better - amazing for BBQs. I’ve listened for around 20 hours and have not had to charge it since taking it out of the box. The only slight down side I have found is that it’s potentially not waterproof as advertised, and I’d be very careful putting something of this price in water. There is a cap on the back with different ports behind it which are certainly not waterproof. When testing I found a surprising amount of water leakage in the compartment - which could easily kill the boom box. Rated 5 van de 5 door TechnoCat uit Polyvalente, claire et puissante, un must have !! Depuis 3 mois que j'ai acheté ma Boombox, je me félicite de cet achat (même si elle m'a coûté un bras) à chaque utilisation ! Pas de distorsion même au volume max, des aigus clairs et des basses ultra percutantes, dans mon salon je me sens presque comme devant un mur de son ! Avec son autonomie au top je peux la balader partout, que ce soit pour une écoute en intérieur, dans mon jardin, sur ma terrasse, au parc, à la plage, chez des amis... d'ailleurs quand je la sors tout le monde la regarde avec envie tant les basses claquent... Franchement, soyez malins, elle est géniale, achetez-là, vous serez heureux!